It's D23 time! The Disney-centric event only happens once every two years and the Mouse House has an awful lot coming down the pipeline between now and 2019, so there is a whole lot for them to showcase at this year's Expo. The celebration kicked off in style with the animation panel, which brought us some brand new details on a lot of upcoming projects. Namely, The Incredibles 2. And we've got a video from the panel for you to check out. 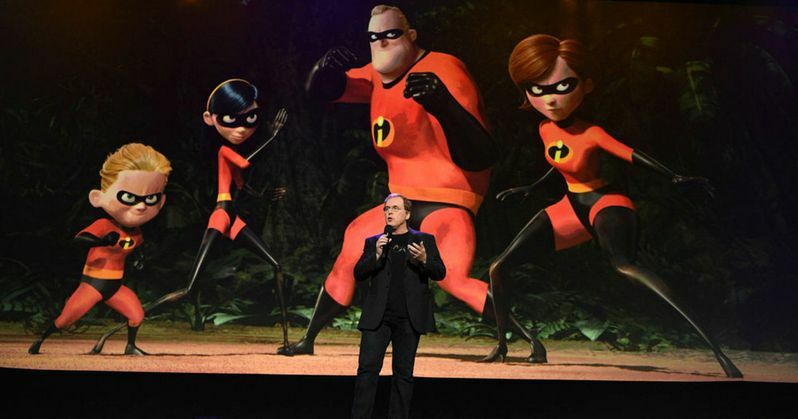 Pixar creative chief was on hand at D23 to present the animation panel and was just as excited as anyone to see The Incredibles 2 finally happening. Lasseter, who's looked forward to the return of everyone's favorite family of superheroes since The Incredibles was still in production, was excited to share a look at what the fashion world thinks of super-suit stylist Edna Mode, who makes her return in The Incredibles 2, once again voiced by director Brad Bird. The petite-but-powerful character was highlighted in a video during the panel, showcasing fashion phenoms from Heidi Klum and Kendall Jenner to Zac Posen and Rachel Zoe. Incredibles 2 director Brad Bird joined John Lasseter on stage to welcome to the festivities the voices of Mr. and Mrs. Incredible (Craig T. Nelson and Holly Hunter), Violet (Sarah Vowell), Dash (newcomer Huck Milner) and Frozone (Samuel L. Jackson). Bird revealed details of the upcoming caper, which puts the family into an expanded universe that includes new allies and a brand-new villain. Here's what the director had to say about the upcoming sequel, which is slated for a June 15, 2018, release. "Incredibles 2 is really a family film, it's just that the family happens to have super powers. They may have super speed or super strength, but they experience the same problems as any family." Since 2009, Disney has been bringing us the bi-annual expo, which has celebrated all of their many fans, but really serves as a great way for them to showcase all of the many films and franchise they have under their roof. D23 Expo is three full days of exclusive sneak peeks at upcoming movies, celebrity appearances, looks at what's coming from Disney Parks and Resorts and Walt Disney Imagineering and a lot more. This year, there is a whole lot to look forward to, but finally getting a look at the sequel to The Incredibles is no doubt going to be near the top of everyone's list. For those who couldn't make it out to the D23 Expo themselves, we've got everything you need right here. We have footage from the panel highlighting The Incredibles 2, as well as interviews with the cast and filmmakers behind the highly-anticipated Pixar sequel, which you can check out for yourself below. Be sure to check back with us throughout the weekend as we will have lots more interviews, panel videos and all of the big news from D23.